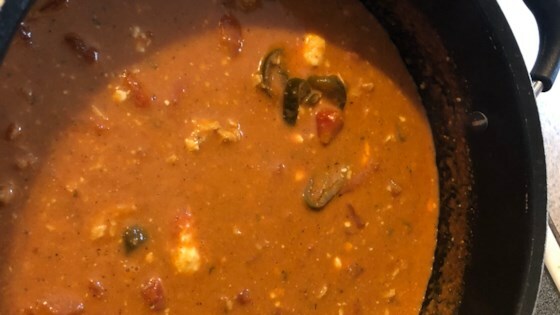 "This is my family's favorite chili . Serve over rice and sprinkle with shredded Monterey jack or Cheddar and a basket of tortilla chips for a great meal! I have also substituted 1 of the cans of cannellini beans with black beans, and it tasted great." In a large stock pot, saute chicken, olive oil, onion, garlic, red bell pepper and yellow bell pepper, until vegetables start to soften. Add chili powder, cumin and oregano. Cook on medium for 3 minutes. Add chicken broth, beans and green chilies and continue to cook on medium low for 5 to 10 minutes. If you want to thicken soup, mix cornmeal with a little water to form a paste and add to chili. Season with salt, pepper and hot sauce and serve. My husband really liked this recipe, but I didn't care for the texture (with the corn meal added in). I also substituted kidney beans, so maybe it's better if you don't substitute. Great recipe!! Not your typical chili. Just be aware that you need the rice or you'll have soup! I changed the recipe a bit by adding some extra spice and using black beans instead cannellini beans. It made great leftovers and even tasted better the second day. This is one of my favorite recipes! I leave out the beans though and add more chicken. Tastes great on a chilly day!